Fireworks are seen over the Olympic Park during the opening ceremony of the 2014 Sochi Winter Olympics, February 7, 2014. 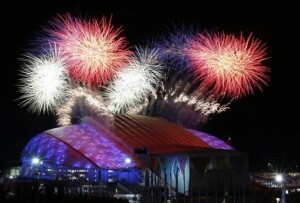 (Reuters) — The Sochi 2014 Winter Olympic Games started on Friday (February 7) with a spectacular show wowing some 40,000 fans for two and a half hours in the Fisht auditorium in the Russian Black Sea resort of Sochi. The ceremony was attended by leaders from China, Japan and about 40 other countries who clapped as athletes emerged from beneath the stage up a ramp for the traditional parade, and a giant satellite image of each nation taken from space was projected onto the floor. The ceremony marked the beginning of the two-week spectacle of sport and the end of a lengthy planning process started seven years before and seen as a prestige project for Russian President Vladimir Putin. The honour of lighting the Sochi Olympic flame was given to two triple Olympic champions as Vladislav Tretyak and Irina Rodnina jointly lit the cauldron at Russia’s first Winter Games. The 61-year-old Tretyak, who won three Olympic ice hockey golds and a silver as goaltender for the Soviet Union and is president of Russia’s ice hockey federation, received the torch from figure skater Rodnina and both former Olympians jogged from the arena to ignite the flame. Fans leaving the stadium said they were overwhelmed by the opening ceremony. “I liked it all,” said John, a visitor from London. “I thought it was interesting all the way through. it was exciting – some great technology. And, the spirit and the hard work that’s been going on, going through here for all the years seems to have paid off. The park is sensational, and good luck to everybody. “I think it’s going to be a fantastic Games,” said John, a visitor from London. Olga, from Yekaterinburg, said she was moved by the ceremony. “I liked the part where there was the ballet – where they danced. It was very touching and I think it reflects Russian tradition and the Russian mentality. Very beautiful. I liked that part,” Olga said. Phillip Gutche, from South Africa said he enjoyed the whole ceremony, but was especially fond of its final moment. Four of the five Olympic Rings are seen lit up at the start of the opening ceremony of the 2014 Sochi Winter Olympics, February 7, 2014. 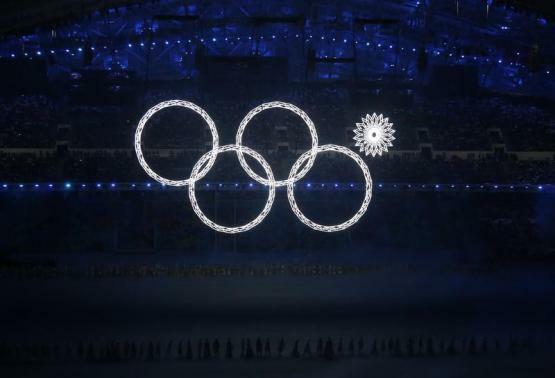 While the ceremony went off with almost no hitches, one of the five Olympic rings failed to open at the start of the show, meaning the symbol could not be illuminated with fireworks as planned.